The Taoiseach rang the bell at the Web Summit in Dublin today. THE TAOISEACH HAS rung the Nasdaq bell at the Web Summit in Dublin. Enda Kenny said that he hoped his image ringing the bell would act as a “clarion call” for Irish emigrants to come home. A live feed of the event was played in Times Square in New York, and other locations internationally. Kenny said that the Web Summit was being held here “in recognition of Ireland’s standing as a digital leader and as a location for business”. He said that the Government wants to create jobs by backing “risk takers, creators and innovators” such as those present at the conference. We intend to be the best [country] in the world in which to do business. This year’s Web Summit will host attendees from 109 countries with over 2,000 start-ups exhibiting, with 700 investors and 1,300 journalists attending the event. Organisers estimate that 22,000 attendees will pump €100 million into the Irish economy. As Europe’s largest technology festival, Dublin will be taken over by Web Summit with 86% of guests attending coming from overseas, 87 venues are being used across the city and some 13,000 hotel rooms and B&Bs having been booked. Happy #websummit day everyone! Where most of us will end up consuming our own weight in caffeine today, let alone the week. Speakers include Peter Thiel, the founder of Paypal and the first investor in Facebook, Drew Houston, the founder and CEO of Dropbox, Eva Longoria, actress and entrepreneur and many more to Dublin for this three-day event. The Web Summit first took place in Dublin four years ago and was attended by around 400 people. Email “Kenny: Me ringing the Nasdaq bell should encourage emigrants to come home”. 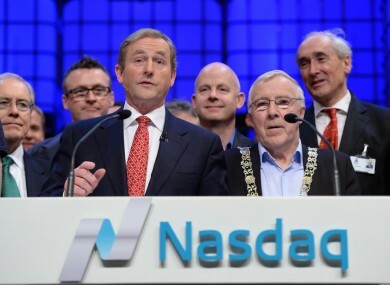 Feedback on “Kenny: Me ringing the Nasdaq bell should encourage emigrants to come home”.